(NaturalNews) Monsanto's business model is falling apart right in front of their own face, because the biotech firm blatantly disrespects the property rights of farmers, contaminating their fields with unauthorized genetically modified seeds. These unapproved GMO seeds inevitably cross-contaminate farmers' fields, effectively destroying their yields. That's exactly what happened in Oregon last year when some unauthorized "zombie wheat" from the Monsanto Company went from the lab and intermixed with a farmer's natural wheat. The debacle disrupted wheat exports as Japan and South Korea blocked shipments. A contingency of farmers have joined forces and sued Monsanto. Although the details of the case have been kept private, Monsanto did acknowledge that an "agreement in principle has been reached, but not finalized." Dave Murphy, founder of Food Democracy Now, is encouraging the farmers not to settle but to stand their ground. This case could establish a new precedent forbidding Monsanto and other biotech firms from cross-contaminating farmers' crops. "Monsanto never settles unless they're seriously vulnerable, and the farmers and lawyers involved in this case should reject any settlement," said Murphy. "Contamination of farmers' crops has been an integral part of Monsanto's business plan, and these farmers need to gain strong legal protections from future contamination events, which are happening daily in farmers' fields all over the world." It's important to note that GM wheat has not been authorized for human consumption. Monsanto publicly states that they have plans to research ways to bring genetically engineered wheat into the US marketplace. When an Oregon farmer noticed wheat growing in a desolate field in 2013, he was stunned. After spraying the renegade wheat with Roundup and checking on it over the next few days, he was baffled that the wheat wouldn't die. It was apparent that experimental "zombie wheat" had cross-contaminated his field. Was Monsanto experimenting covertly or was the cross-contamination caused by past attempts to usher in GM wheat? As the news broke out, the export market grew wary. 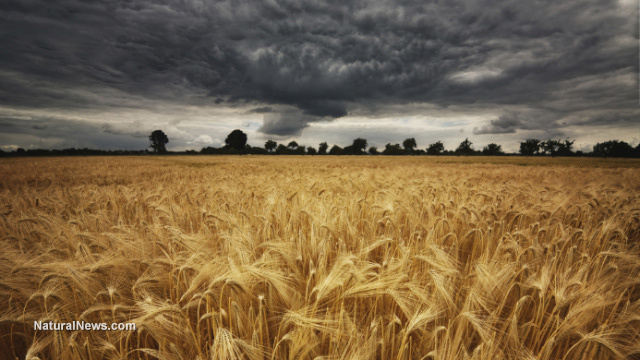 Some US wheat exports were halted, which caused a temporary price drop for farmers. China monitored the situation closely. This is yet another way Monsanto's business model damages the livelihood of farmers. Oregon farmer joins forces with Kansas farmers to prevent future contamination caused by "zombie wheat"
The Oregon farmer joined forces with farmers in Kansas and filed suit against Monsanto's bully business practices, citing the biotech firm's negligence that resulted in loss of business for individual farmers. The Center for Food Safety also joined in on the suit. "Monsanto has put our farmers' wheat export market at grave risk. Billions of dollars, and our food supply, is at risk because of Monsanto's negligence. They must be held accountable," Andrew Kimbrell, executive director of the Center for Food Safety, said last summer. Monsanto executive Robert Fraley contends that the case in Oregon was a result of sabotage. As the "zombie wheat" case presses on, it will be interesting to see whether they ditch their official story of being sabotaged and actually start to take responsibility for cross-contaminating the farmer's wheat. Monsanto's business model now reveals serious legal vulnerabilities. By introducing GM wheat strains into test fields, Monsanto inevitably allows cross-contamination to occur, overtaking the biodiversity that is needed for crop survival in an ever-changing environment. By slowly taking over biodiversity of seed, corporations like Monsanto begin to dominate the food system while putting humans at the fate of one-mode agriculture that relies on pesticides to survive. True survival of the food system relies on biodiversity of seed, and Monsanto's faulty business model destroys just that, putting human civilization at risk. Murphy of Food Democracy Now said, "With this lawsuit, the contamination of farmers' crops with their patented GMO genes is finally being exposed as the real threat that GMOs are to modern food production and the financial liability that could bring Monsanto down." Monsanto was recently sued in July 2014 and ordered to pay residents of Nitro, West Virgina, a $93 million settlement after the court found the firm guilty of exposing residents to dioxin from a nearby plant. There's no doubt now that Monsanto's business practices are unraveling. The ways they contaminate farmers' property and poison communities are all being exposed as people wake up to the havoc that this monster is causing on the planet.